Missing Information: If you try to travel to a place where your cost is above 5 gold and you need to deduct funds from your letters of credit (from the bank), the game doesn’t interpret this properly and what ends up happening is is your cost ends up costing a large amount (like “4294967246” as shown in the video), although, this will not stop you from travelling there anyways. The source also reports that this glitch in fact gave him money back in gold form, which encumbered his character. Editor’s Note: I have tried to do this unsuccessfully, and there’s no patch notes about this, so I might be missing a step? Unknown Causes: Under certain circumstances, all of a sudden you may happen to hear an extremely jarring and loud “glitchy” sound effect being played over and over. Some believe this to be something to do with light sources in dungeons. When you leave the area, it stops from happening; however, using the volume of the sound, it does appear as though it is coming from light sources. Flying or swimming creatures have some issues while going up inclines in terrain. Sometimes they will fall right through the ground and if you have hit them before their fall, you will get the message of that they have died, presumably from falling outside of the map? When you cross the border of two provinces in the game that have different climates, there is no transitions between them. The weather, textures, and trees will change instantly to accommodate your new area. When you fall into water, you don’t actually fall “into” it at all, it will appear to be a hard surface at first and even damage you if you took a large fall into it, the same amont of damage you would have taken if it were another surface. Unknown Causes: After getting off of a ship, the source, discovered there was extremely steep wilderness terrain in spots. He has not been able to get it to happen on any other computer, but has made it happen on several occassions. 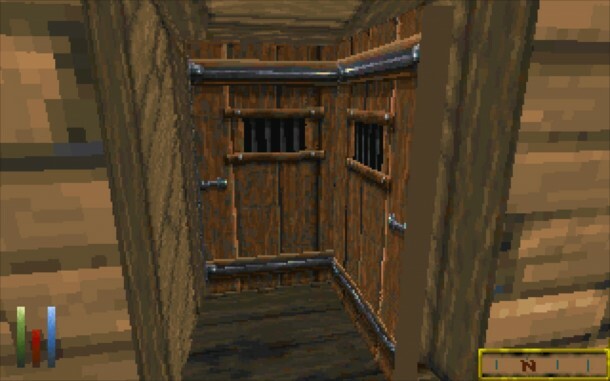 Although, not technically a glitch due to game programming, but lack thereof to account for faster computers. 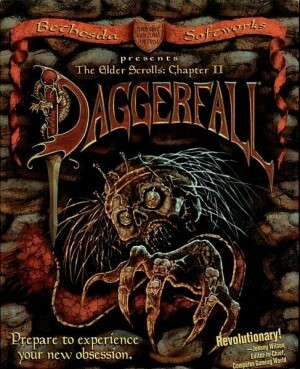 When Daggerfall is played on a modern machine either natively, or through an emulator such as DOSBox, many game functions will not work properly or at all. Including: Climbing, Swimming, Jumping, Horse movement and more. To solve this running the game natively, you will need to use a CPU-limiting program such as Cpukiller to make your computer process slower than normal. When running through DOSBox, limiting your cycles to 28000 should slow the game down, but not enough to be too laggy for you to play.